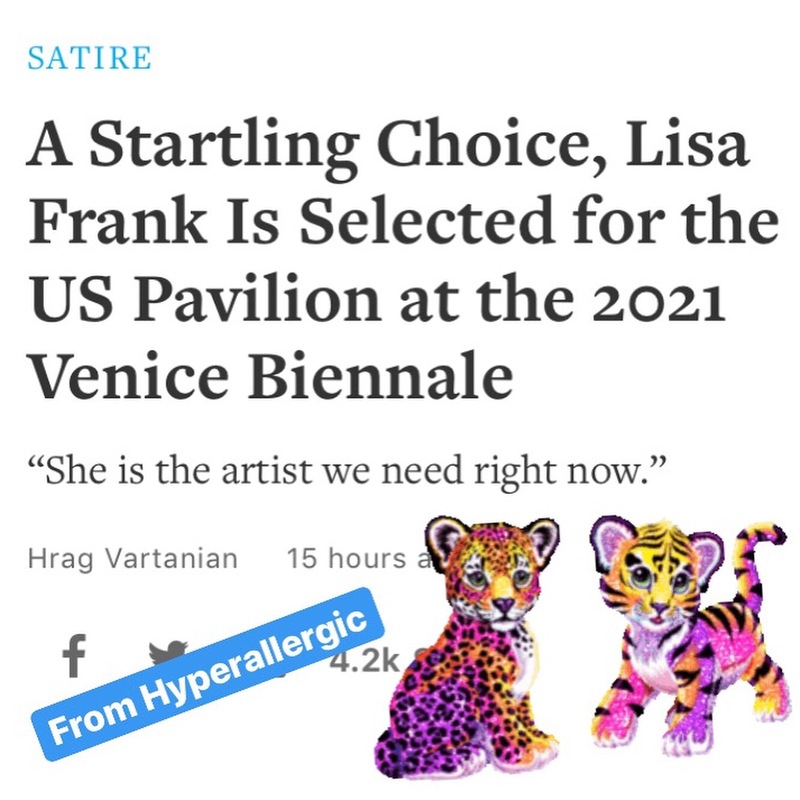 “A Startling Choice, Lisa Frank Is Selected for the US Pavilion at the 2021 Venice Biennale” nods to art as escape, the marriage of the art and capitalism, catering to lowest-common-denominators to attract interest, and more. Screenshot of Hyperallergic article posted on April 1, 2019. Emoji has been added by Marabou. “The Whitney Museum Unveils Panic Room Designed for Board Members” pokes fun at museum director Adam Weinberg’s statement that the Whitney is a “safe space for unsafe ideas.” The article answers the question, “For whom?” The safe/unsafe quote is from Weinberg’s response to a staff letter asking for the removal of Board Vice Chair Warren B. Kanders because of his ties to Safariland Inc., a company that supplies tear gas that has been used on protestors (Ferguson and Standing Rock) and refugees (Tijuana/US Border, Palestine). The article ends with this quote, “It’s almost like the museum values money and art more than human life,” echoing the call of protestors who are staging 9 Weeks of Protests leading up to the Whitney biennial. Screenshot of Hyperallergic article posted on April 1, 2019. Emoji pill and cartoon of diamond skull added by Marabou. “Sackler Family and Purdue Pharma Fund Damien Hirst Pills Retrospective” walks the line of believable and unbelievable, highlighting the reality of wealthy donors artwashing the money they’ve made off unsavory business like big pharma driven addictions and death, gentrification, and war. Marabou appreciates Hyperallergic’s clever work. It brings a chuckle, but also reminds us that there are real issues and crises facing the spheres of art and culture that need our attention.